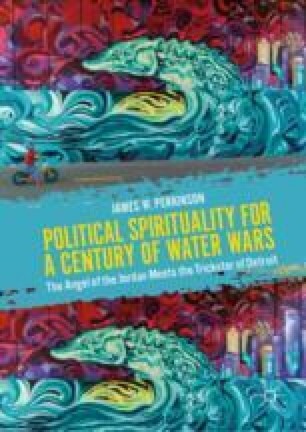 Chapter 3 will push the historical perspective further back into pre-colonial and colonial history by underscoring the way recent Native American efforts to counter the DAPL pipeline at Standing Rock insisted on a traditional orientation of water protection for generations to come, not merely political resistance. In setting up the “turn to water relations,” we will deeply explore the delirium of Euro-settlement around the river by way of Steve Newcomb’s layered analysis of the Doctrine of Christian Discovery and the finesse of creative “border-crossings” negotiated by enslaved denizens of the Strait as recovered in Tiya Miles’ storied treatment. Carmody, Steve. 2015. Activists Call for Changes to Water Policies in Detroit and Flint. Michigan Radio, July 3. Viewed June 24, 2018, http://michiganradio.org/post/activists-call-changes-water-policies-detroit-and-flint. Parenti, Christian. 2017. Climate Change Is Creating a New Urban Crisis. The Real News Network, August 30. Viewed June 13, 2018, https://www.youtube.com/watch?v=ZRXDrLnDVJY. Stonefish, Ogichidaakwe Mona. 2016. Detroiters Speak—(Re)Discovering Detroit: From Oppenago to Wawiatanong to Detroit. Talk given at Cass Corridor Commons, February 11, 2016, as part of Detroiters Speak: A Collaborative Community Classroom Organized by UN and WSU. Viewed June 13, 2018, https://lsa.umich.edu/sid/events-news/all-events.detail.html/28295-2701541.html. White, James (ed.). 1913. Handbook of Indians of Canada. Published as an Appendix to the Tenth Report of the Geographic Board of Canada, Ottawa. Viewed June 24, 2018, http://faculty.marianopolis.edu/c.belanger/quebechistory/encyclopedia/NanabozhoIndianstoryofthecreation.htm.